Vivian Lynn Morrison, 75, of Pekin passed away Saturday, January 26, 2019 at OSF Richard L. Owens Hospice Home in Peoria. She was born July 12, 1943 in Sileby, Leicestershire, England to William and Mabel (Hughes) Cornish. She married Edward Lyn Morrison on July 18, 1964 at St. Mary's Church in Sileby, England; he survives. She is also survived by her children, Ian (Andrea) Morrison, Julie (Tom) Svendsen, Gary (Teresa) Morrison, Michael Morrison, David (Jami) Morrison; grandchildren, Tom and Erica Svendsen, Jacqueline, Gina, Brianna, Jessica, Lucas, Bailey and Kaitlyn Morrison, Heather and John Duchardt and great-granddaughter, Serenity Duchardt. Her parents; brother, Bryn Cornish and sister, Brenda Richardson preceded her in death. She attended Humphrey Perkins School in Barrow Upon Soar, England. Vivian immigrated to America with her husband and two oldest Children in May 1968. She worked as a bus monitor for Pekin District 108, volunteered at Pekin Hospital and was a den mother. Her greatest joy in life was her grandchildren and her garden. 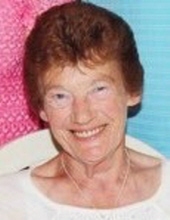 She enjoyed attending and supporting her grandchildren’s sporting events, dance recitals and school achievements. She loved having a pool for family gatherings during the summer and Scottish Terriers. Vivian was famous for her sausage rolls. She enjoyed vacation, traveling and tea time. She was a loving wife, mother and grandmother; she will be greatly missed. The family would like to thank the staff at OSF Richard L. Owens Hospice Home for the wonderful care given to Vivian and her family. Her funeral service will be held on Saturday, February 2, 2019 at 12 noon at Abts Mortuary in Pekin with visitation two hours prior at the funeral home. Burial will follow the service at Glendale Memorial Gardens in Pekin. Memorials may be made to St. Jude in her name. To send flowers or a remembrance gift to the family of Vivian Morrison, please visit our Tribute Store. "Email Address" would like to share the life celebration of Vivian Morrison. Click on the "link" to go to share a favorite memory or leave a condolence message for the family.